The World Below is on Ancient Faith Radio! Exciting news! “The World Below” seminar is on Ancient Faith Radio! Please give it a listen if you get a chance! Here’s the link: The World Below – Ancient Faith Radio. The seminar took place on June 30, and the speakers included myself, Fr. Patrick O’Grady, and David Paddison. Give the seminar a listen, and then join the conversation by commenting on this post! 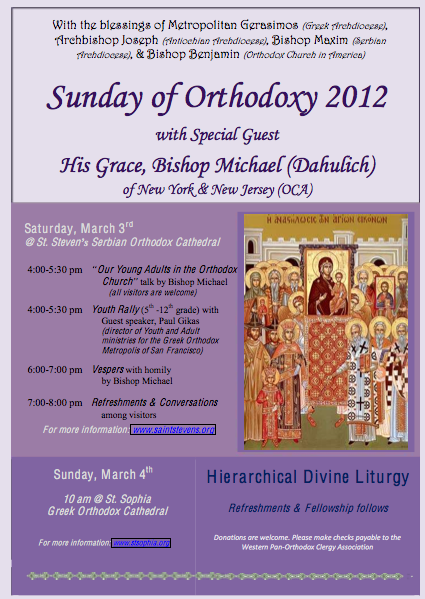 Sunday of Orthodoxy Youth Rally! On Saturday, March 3, the Pan-Orthodox celebration of the Sunday of Orthodoxy will begin! Wahoo! St. Stephen Serbian Orthodox Cathedral will graciously host as many young people as possible. Saturday, at 4PM, a youth rally will be held for all youth in grades 5-12. Orthodox youth will assemble from the various jurisdictions in the hope of seeing that global Orthodoxy includes all those who will enter the Lord’s house. It should be a fantastic time simply to come together with others who share the Orthodox Christian Faith and commune with them! The Youth Rally and adult talk will be followed by all assembling for Vespers at 6:00PM, and refreshments will follow the service. On Sunday, March 4, there will be a hierarchical Divine Liturgy at 10:00AM! Yippee! NOTE: The Divine Liturgy will be served at St. Sophia Greek Cathedral in Los Angeles, NOT at St. Stephen. All parishes in the Antiochian Southern California Deanery will be closed on Saturday evening so as to encourage as much attendance as possible. I will be will there, for sure, and I certainly hope to see as many of you as possible! Here is the event flyer!!! YAY! Why Are You Doing Ministry?